You really need a chiffon cake, rather than a butter cake, when you're making cakes with a filling or frosting that must be refrigerated. Chiffon cake is fine straight out of the refrigerator, but butter cake needs to be brought to room temperature for the proper texture. My recipe shows my basic chiffon cake formula of equal weights of flour and sugar with about the same weight of eggs out of their shells. I have no idea about the science behind that, but it works for me. Most chiffon cake recipes call for more eggs, but I don't like the resultant overwhelmingly eggy flavor. These are wonderful with buttercream frosting, but I prefer whipped cream and so whipped up a batch of stabilized whipped cream. I hadn't made any since my cake decorating days, so I refreshed my memory with this wonderful stabilized whipped cream post from cake maker extraordinaire Brooks Walker. Compared with buttercream, this is really "diet" frosting -- less fat and a lot less sugar. It's always been my habit to scrape off the frosting because it's always much too sweet for my palate. I'd rather have whipped cream, but regular whipped cream can't be piped ahead of time and sometimes you just don't want to be messing about with it at the last minute. I didn't do a particularly good job of piping (having issues with my piping arm! ), but I refrigerated half the cupcakes in a lidded Pyrex container for 24 hours and found them to be looking and tasting every bit as good the next day. This is my new favorite frosting, so I'll be making chiffon cupcakes more often than butter cupcakes. Update 03/29/16: I forgot to mention that you can also use the stabilized whipped cream as a filling, which I did on about six as an experiment. Just stick the piping tip into the top of the cupcake about halfway in and squeeze gently until the top of the cupcake starts to bulge. And the stabilized whipped cream is perfect for pies, such as this Chocolate Cream Pie for Two! 1 Separate cold eggs; bring yolks and whites to room temperature. Preheat the oven to 350F/180C/Gas4. Line standard cupcake tins with paper liners. 2 In bowl of stand mixer, beat egg whites to stiff peaks; set aside. 3 In medium mixing bowl (I use a 2.5-quart), whisk together flour, cornstarch, sugar, baking powder and salt. Make a well in the center, and add oil, water, egg yolks and vanilla extract. Beat until smooth. 4 In three batches, very gently fold the beaten egg whites into the batter. 5 Using a 1/4-cup measure, divide the batter among the 18 muffin cups. The cakes will puff quite a bit during baking but then settle back down. 6 Bake the cupcakes for 15 to 18 minutes. Remove the pan from the oven and let cool for 5 minutes. Remove cakes from tins and cool completely on wire racks. 7 Measure the water into your smallest pan; sprinkle the gelatin evenly over the water. Let stand for 1 minute until the gelatin granules have plumped. 8 Over low heat, stirring constantly melt the gelatin. Remove from heat; let it cool, but not to the point of setting, while starting to whip the cream. 9 In mixing bowl, whip the cream with the powdered sugar and vanilla extract until it begins to thicken. 10 Whisk a little of the slightly whipped cream into the liquid gelatin until well blended. (If the gelatin has jelled, gently heat it again until liquid and let cool before using.) Add this mixture to the whipping cream in the bowl. Once it is incorporated at low speed, whip at high speed until stiff peaks form. 11 With a pastry bag fitted with a 2D tip or a 1M tip, pipe frosting on cupcakes. Refrigerate, covered, until serving time. I'm another icing-scraper, finding most too, too sweet. I wonder if this Stabilized Whipped Cream Frosting could hold a little coconut. I think it would be really good with a coconut cake - even if I just sprinkle with toasted coconut before serving. Thanks, Pondside. Yes, I think it could hold a little coconut. You can do all sorts of things with it. Glad to know another icing-scraper! These look delicious Jean. I am having company for a couple of weeks and I will make this recipe. Thank you! It has been lovely going through all your recipes today. This is a match made in heaven! No, no – sorry – I’m not talking about the match of frosting to cupcake, rather the yin and yang completeness of our approach to sugar! You like whipped cream because of its diluted assault on your sweetness tastebuds, I like buttercream because to me choosing whipped cream over the former is like PRONOUNCING the word “sugar” instead of EATING it. In fact, in my sugar emporium, I’m more apt to dispense with the cupcake in favor of the frosting altogether. Should I start a calorie disposal service wherein people notify me to come pick up their buttercream rather than scraping it off their cupcakes? Robin, thank you. I hope you will try them soon and let me know how they turned out for you. Thanks, Denise! I think you'll find they go well with a cup of tea (true of most of my recipes -- a recurring theme!). Yes, Sully, people like us are a perfect match -- one to eat the cupcake, one to eat the other's scraped-off frosting! Mr Delightful and I do similar with pizza -- I peel the pepperoni off mine and put it on his slices. I agree, I don't like eggy tasting cake, nor do I like tons of overly sweet frosting! There has to be a balance and this sounds just about right. Also that light, creamy frosting looks like a good bed for some tasty toppings! Smart man, Richard! I say that to everyone who agrees with me! If only I'd had some nice little berries to set on top. I was really surprised that it worked when I switched to weighing eggs first and matching the ingredients accordingly too! Like you, I'm put off by too much icing but your recipe sounds - and looks - good. Ooh, that bread recipe below really does it for me - I can almost smell it! Chris, thank you. And, yes, isn't the smell of bread just the best! I'm one of a very small minority of US cooks who weigh ingredients. Funny, I usually find icing too sweet too but my hubby likes it; the sweeter, the better. So, yes, I often scrape it off too. I use whipped cream instead of icing quite a bit for that very reason. But I've never made the stablized kind. That's new to me. Your cupcakes look amazing! Lovely little treats and just enough instead of a big slice of cake. Thank you for sharing, Jean, and have a lovely weekend. Sandi, thank you. Do give the stabilized whipped cream a try. I think you'll really like it. This looks like a recipe that would be delicious on its own but can also take a lot of variations, can't wait to give it a try. Margaret, thanks. I hope you have a beautiful weekend. Yes, Amalia, lots of variations -- I like to add lemon or orange zest or even cocoa. Coconut works. Lots of possibilities! I hope you'll try them and let me know how they turned out for you. Chiffon is my absolute favourite! These look so beautiful, Jean. 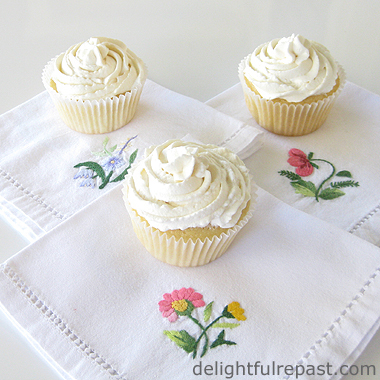 Jean, these Vanilla Chiffon Cupcakes couldn't be any more splendid, and paired with whipped cream on top makes them a light, airy dream! You bring up brilliant points about the virtues of chiffon v. butter cakes in relation to serving temperature and texture. I'm glad the stabilized whipped cream post brought a past recipe to the surface. Thank you, my friend, for the lovely compliment and shout out. May your holiday weekend be grand. Cheers! Thanks, Angie! You have a wonderful weekend, too! Brooks, besides reminding me of the recipe from the past, your video and post included tips that made my stabilized whipped cream turn out well the first time after all that time. And, believe me, if I'd had to throw out a batch I would not have been happy with myself! I have no words to express my delight after having seen your so wonderful cupcakes and after having read their recipe ... I want to try them for Easter Monday when we in Italy do use to have lunch outside in the countryside, making what you've taught us is called a 'pic-nic', on the first grass of Spring ! Thank you once again for sharing all your cooking experience and knowledge with us, my sweetest Jean ! May your Easter be blessed with Peace and Joy, I wish it to you with all my heart ! Dany, thank you so much. I'm glad you will make them for your picnic Monday. I hope you will enjoy them and your whole weekend! ,"well, that's not healthy." A woman near me reached over, in an aggressive, almost angry way and a grabbed a packet of the same said cakes from in front of me and roughly placed them in her basket walking off quickly. I wonder why? Your cup cakes always look wonderful though Jean. Tony, I think if everyone started reading labels they'd stop eating junk food! I eat *only* homemade desserts. I believe we're better off not eating *any* sugar, but I know I'm not going to give up desserts entirely. But my "homemade only" rule keeps my sugar intake way down. And, of course, my homemade food is all organic so that cuts down on other bad stuff as well. Honestly, Jean, I had completely forgotten about stabilized whipped cream. And I didn't know that it chiffon cake came out of the fridge just fine. 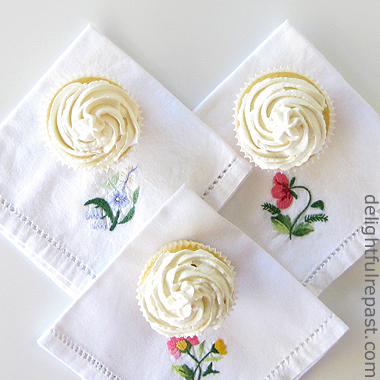 I will look forward to trying this soon, although I will probably make a cake rather than cupcakes. I suppose I can still have some piping fun with that! David, I don't know how I let stabilized whipped cream fall out of my repertoire for so long! And you can have a lot of piping fun with a cake as well as cupcakes! I love cupcakes, I love baking them and I love vanilla cupcakes. I am going to give these a try. Carol, thanks. I hope you'll try them soon and let me know how you liked them! What beautiful, light and elegant cupcakes, Jean! I really like the frosting. It's so nice to have a lighter yet still rich frosting. Pinned and stumbled. Thank you for sharing with us at the Hearth and Soul Hop. Thank you, April! Social media shares are sooooo appreciated (since I don't have a clue about most of those things!). Hello Jean, your cupcakes look amazing! Hope you have a nice week! Thanks, Julie. I'll be making more of them this week! Thanks so much for coming by and taking the time to leave a comment! They make my day :0) And also gives me the opportunity to meet 'new' bloggers. Your recipe sounds fantastic! I, too, prefer less sweeter treats. My palate has changed so much in the last year. I'm looking forward to browsing more of your posts! Have a beautiful week!! Suzanne, thank you. It always pleases me to find another person who appreciates my less-sweet sweet treats! Thanks, PP! And I think they're a little "healthier" without all that sugary icing. Yes please, Jean, I'd love one of your chiffon cupcakes with the stabilized whipped cream! They look so pretty, and they'd be delightful with my cup of tea! You make beautiful cupcakes, if my daughter see this she will ask you to make a frozen cupcake for her birthday which is coming next month. Thanks for sharing with Hearth and soul blog hop Jean, Pinning and tweeting. Thanks so much, Swathi! I would feel good about making these for your daughter, since they're not so sugary as most frosted cupcakes. Your Pins and tweets are much appreciated! Jean...these look absolutely delicious! Perfect for tea! Hamacaan, thank you! You'll find them really quite easy to make.